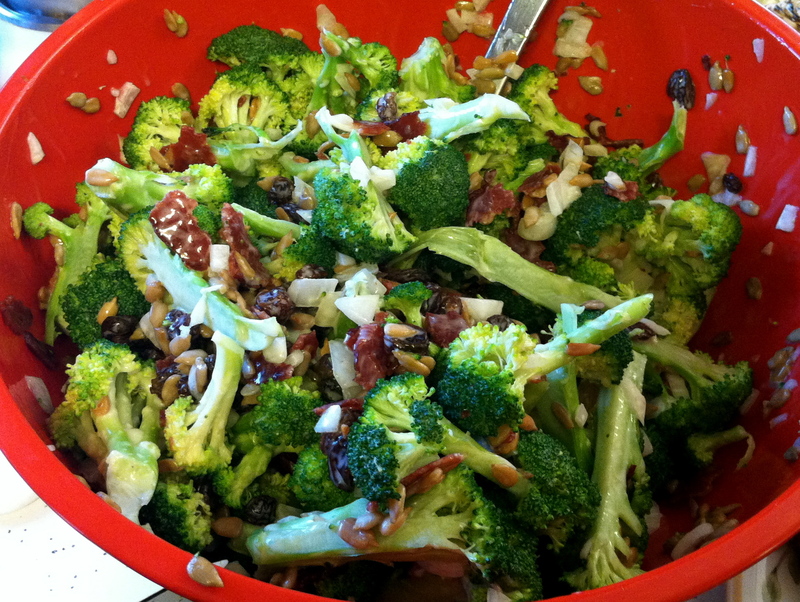 This is seriously the best broccoli salad I have ever eaten. 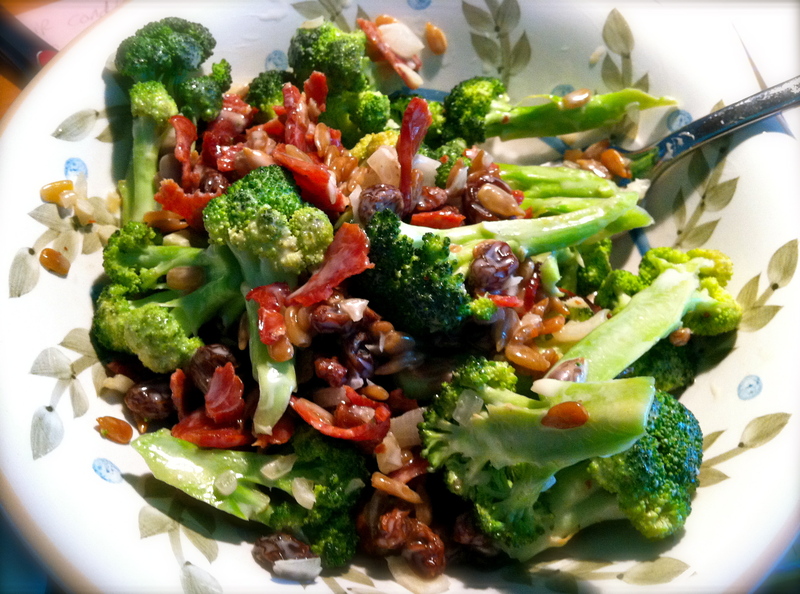 Hence the name ‘Best Ever Broccoli Salad!’ If you are a fan of broccoli and want a salad that combines fresh, crunchy raw broccoli with the taste of salty and sweet, this is your salad! This salad is perfect for Labor Day or any other barbecue or family gathering. It is also great alongside any grilled meat for a quick and healthy accompaniment to a meal. Even non-broccoli lovers will be happily munching on it, asking for more. You can be assured that if you serve it, it will be the delight of many. And you may just have a few people knocking at your door asking for the recipe. I am getting this recipe out for you just in time for your Labor Day celebrations. 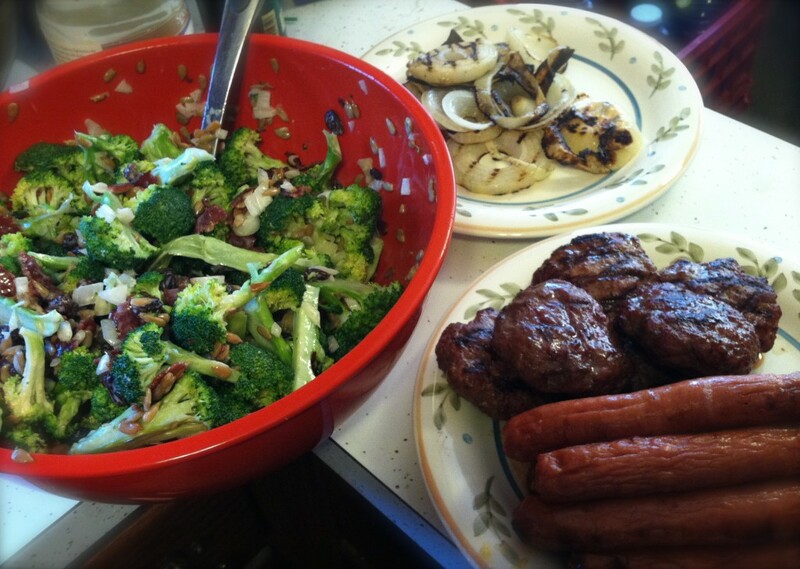 Labor Day last year is when I first made this salad at a gathering with my husband’s family. I found the original recipe by Mrs. G.F. online several years ago. Then it just sat in a basket with dozens upon dozens of other recipes that I used to print with hopes of making someday and satisfying my palette. Now I use Evernote to save and collect all of the delicious recipes I find online and it is better for the environment too! 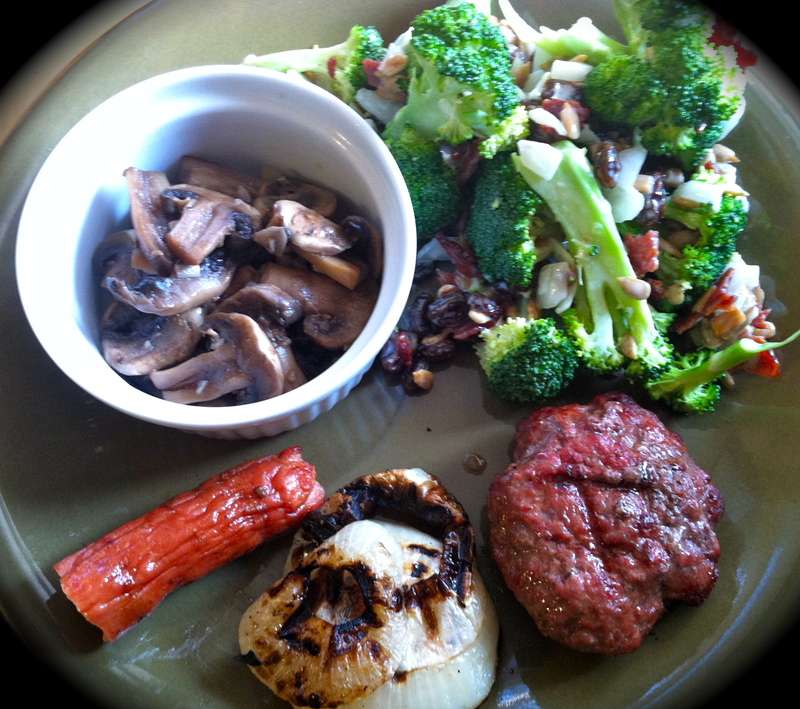 When I revisited the recipe – I knew it was a winner but made some changes to increase it’s nutrition. I modified the recipe in several ways. First, I quadrupled the broccoli bringing you more healthy goodness. Broccoli is loaded with vitamins C & K, antioxidants and great at helping with inflammation and detoxification. The large amount of broccoli also ensures that the dressing on the salad remains very light and does not leave the salad tasting heavy or weighed down. I changed the vinegar from white to apple cider vinegar. Apple cider vinegar offers many health benefits which is why I choose to use it in all of my recipes that call for vinegar. I reduced the sweetener (which was white cane sugar) in half and substituted honey. While the original recipe called for bacon, (which I know a lot of people love – if you are one of them, use regular bacon here!) I substituted turkey bacon which is healthier than regular bacon and lower in fat. I substituted organic mayonnaise by Spectrum which has great flavor and is much less processed. If you are not keen on using mayonnaise, feel free to experiment with Greek or plain yogurt. If you have success making substitutions, please let us know by leaving a comment! Without further ado, here is the recipe! I hope you enjoy it as much as I do. I know you will. It tastes great leftover for 1-2 days. I like it so much, I often even eat the leftovers for breakfast! Good way to get your veggies in early, right? *To make AIP/Autoimmune Protocol: Wellshire Organic Uncured Turkey Bacon is compliant with strict AIP! Omit the sunflower seeds. For the dressing: One cup coconut milk, 1-2 tablespoons honey, 3-4 tablespoons apple cider vinegar, 4 pinches sea salt. It really has to be made to taste–I prefer things less sweet and very tangy! Note: The AIP version of this dressing is runny but the flavor is fantastic! Preheat your oven to 385 degrees (this may vary based on your oven). Place turkey bacon side by side on baking sheet and bake approximately 15-17 minutes per side, flipping after the time is up on the first side. Bake until crunchy. Place on paper towel lined plate to cool. Cut up broccoli into bite sized flowerets and put in large bowl. Chop one yellow onion. Measure one cup each of sunflower seeds and fresh, plump raisins. Once cooled, tear up turkey bacon into little pieces. To make dressing: measure the mayonnaise, honey and apple cider vinegar in a bowl. Whisk until smooth. Before serving add all ingredients to the broccoli in the large bowl. Gently stir to distribute ingredients. Add dressing, stir again and serve. Enjoy! (If serving for a party, simply cut/prep/measure all ingredients and place in separate storage containers. Before serving, toss everything together, add dressing, stir to mix ingredients and serve. Made this for Christmas dinner without the bacon. Two diabetics in our family. Everyone absolutely loved it and begged for recipe. Even those who don’t have special diet needs. A new family favorite! Just finished making the dressing. It tastes great. This will be wonderful not only for the diabetic in our family but for everyone. Thanks for the recipe. Do you know the serving size and carbs per serving?